Springtime for Public Works: Potholes, Street Sweeping, and Yard Waste Collection! Council Members Scroeder, Fletcher, and Ellison with a Public Works Surface Water & Sewers staff member. Last week, I got the unique opportunity to visit one our City's storm sewers with our Public Works Department. 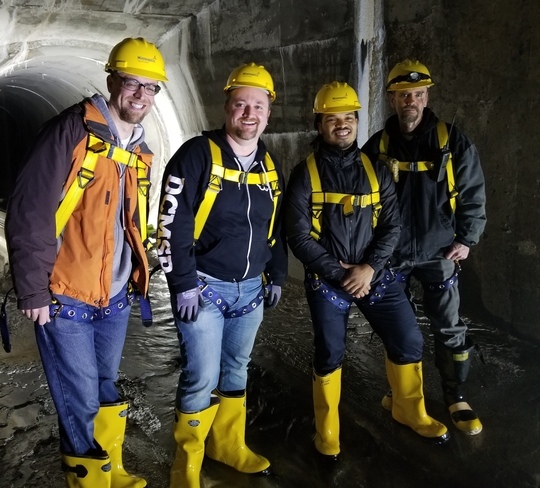 It was an eye-opening and impressive experience to see a critical piece of our City infrastructure that is almost entirely invisible to us, 80 feet below ground, on a day-to-day basis. Our City sewers were originally built over 100 years ago, and there was one combined system for wastewater and storm water. In recent decades, the City made the necessary investment to fully separate our storm water sewers from our wastewater sewers in order to keep the Mississippi River clean. I'm very glad to report that that investment has paid off: Minneapolis is now one of the few cities in the entire country to have a fully separated system, and to have done so without federal intervention. As the City grows, however, we continue to put greater pressure on our storm sewers, and the work continues to maintain and upgrade some of our tunnels. Last week, the city released a first draft of the City's 2040 Comprehensive Plan. A whole lot of impressive work and planning - particularly by Council President Lisa Bender and Council Member Kevin Reich, as well as by city staff from across the city enterprise - has gone into incorporating three years of community feedback, policy best practices, and a clear vision for equity and sustainability into this document. It includes a set of guiding goals and specific policy ideas that, if we can move them into action, would mean great things for Minneapolis. This document is very, very good, but it's not perfect. In fact, that's the point of releasing it now. By getting this first attempt at distilling community feedback into a written document, we can move the conversation forward by giving people something clearer to which we can all respond. This will (and should) improve quite a bit in response to public comment in the coming months. With the addition of your ideas and feedback, we can really make this the guiding vision our city deserves. As you read, try to think of the whole, big picture before getting too focused on a specific policy proposal. Some of these ideas are things we ought to do anyway, and some are things that are only feasible in the context of the entire vision - that's why we call it "comprehensive." Over the coming months, the City will do extensive outreach to residents to hear their concerns and ideas to improve the quality of life in the City. Comments will be collected at public meetings as well as online through July 22, 2018. That feedback will be taken into consideration as City staff revise the plan for City Council consideration. The Minneapolis 2040 website is designed to gather feedback, and be an interactive way for us to continue the conversation about our city's values and vision. 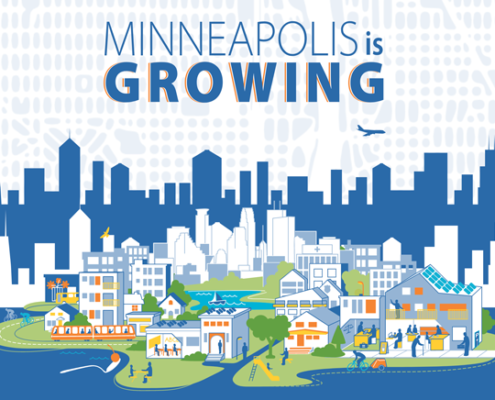 Please do give your feedback on the website, by email to 2040@minneapolismn.gov, or on Twitter: #Mpls2040 @Mpls2040. Street Sweeping: Public Works crews will begin posting spring street sweeping signage on April 16, with the city-wide sweep starting on April 17 and lasting approximately four weeks. This thorough cleaning of all 1,100 miles of city streets and parkways is done every spring and fall with the goal of keeping our city clean and our neighborhoods livable. Removing the sand put down for winter maintenance, along with trash and decomposing leaves helps to prevent flooding in our streets and keeps our water ways healthy. Our sweepers are already out on the roads, weather permitting, as part of our general spring clean-up, but this dedicated curb-to-curb sweeping ensures that we can get access to all of our city’s streets in the most efficient way possible. Interactive web tool – You can use a tool on the City’s website to find out when the sweeping crews are coming through your neighborhood! By the Friday before the first week of the sweep, you can go to this page and click on “street sweeping schedule lookup” to find out which week a street is scheduled to be swept. The weekend before that week, you can revisit the website to find out which day of the week the street is scheduled to be swept. Potholes: We know this is the time of year when potholes become more apparent and we have crews dedicated to this work. Pothole locations can be reported through 311 or on the pothole reporting page of the City’s website. We are currently using a cold patch to improve the drivability of our streets until the asphalt plant is up and running for the season and more permanent patches are installed by our crews. Yard Waste: Our Solid Waste & Recycling crews will begin collecting yard waste for the 2018 season the week of April 9. This service will be offered weekly, as part of resident’s regular garbage day collection and will continue through the fall. Lower energy consumption and maximize energy efficiency in all building sectors (commercial, industrial, and residential). Make more clean energy (renewable energy and energy efficiency) accessible and available through new inclusive financing tools. Make the city more sustainable/resilient through increase local renewable energy. Part of the work that has been developed within the Clean Energy Partnership is the City of Minneapolis’s green business cost-sharing programs designed to help the city support a thriving business community and foster a clean, healthy environment. 2018 brought some exciting new updates to the program by adding in a solar program and setting priority on businesses in environmental justice priority areas known as Green Zones. Businesses can apply now for 2018 programs. Businesses and multi-family residential buildings with four or more units that are willing to invest in cleaner, greener, or more efficient technologies should apply. There are opportunities in energy efficiency, solar, automotive repair, or even manufacturing/industrial projects that produce win-win solutions. There are many solutions already in the marketplace that can reduce environmental impacts. The funds for the program come from pollution control fees that businesses pay to the City. Application deadlines are March 1, April 1, May 1, and June 1, 2018. Following a technical review of the corridor and feedback from stakeholders, the City of Minneapolis, Hennepin County, and MnDOT are recommending the installation of a pair of one-way protected bike lanes on University Avenue SE (eastbound) and 4th Street SE (westbound) between Central Avenue SE and Oak Street SE. Flexibility in its design over time: this one-way pair can be implemented through signing, striping, delineators, and some traffic signal modifications, which allows for greater flexibility to modify the design after installation. Opportunities for traffic calming on both University and 4th Street, with shorter crossing distances for pedestrians and fewer travel lanes on 4th Street SE. Opportunity to add a full time parking lane on 4th Street SE. While the recommended design is for a one-way bikeway on University Avenue SE, the City of Minneapolis and Hennepin County will continue to monitor bicycle traffic to consider future accommodations or improvements for westbound bicycle traffic. The three agencies are sharing the concept with stakeholders in spring of 2018, and will seek Council Approval for the project later in 2018. The project is proposed to be installed in the summer of 2019 in coordination with the Hennepin County resurfacing project on University Ave SE between I-35W and Oak St SE. The Open Streets calendar is set for 2018 with seven events scheduled around the city! Mark your calendar for one or all seven to explore neighborhoods in a safe, fun, family-friendly environment. Open Streets Minneapolis is a free event and it's so much fun -- we close major streets to car traffic for the day, opening them up for walking, biking, rolling and playing, and for community groups and local businesses, too. Find more information at www.openstreetsmpls.org. Are you or someone you know interested in shaping city policy on a wide array of issues? There are many openings on 15 boards, commissions, and committees that provide valuable insights, help shape key policy decisions, and provide community-based input into the City's administration of services. Stay up to date on vacancies, position descriptions, and timelines here. And spread the word to folks you think would be a good fit. minneapolismn.gov/boards/openings. Potential applicants can find more information at 612-673-2216 or OpenAppointments@minneapolismn.gov. The City of Minneapolis is working to redesign our entire public website, www.minneapolismn.gov. As part of the project, Minneapolis residents’ and business owners’ input is needed. Focus on your needs, improving the browsing experience for residents, businesses and City staff. Foster improved two-way communication with consistent, high-quality content. Be ADA-compliant and accessible to users with disabilities. Better reflect the diversity and identity of Minneapolis. Please take this survey to share your thoughts and ideas with us! I serve as Vice Chair of the Public Safety and Emergency Management Committee, and we are hosting two community forums to engage with residents on the work of our committee. The first was Wednesday, March 28 and the second will be Tuesday, April 10 from 5-7p.m. at Sabathani Community Center, 310 E. 38th St. These forums are interactive and serve as opportunities for neighbors and City policymakers to work together toward improved community safety in Minneapolis - please join us as we shape this vision together! 5-7 p.m. Tuesday, April 10 at Sabathani Community Center, 310 E. 38th St.
We held our second Good Morning Ward 3 on March 28 with Long Range Planning Director Heather Worthington and had a great discussion about the City's draft 2040 comprehensive plan. Join us for our next Good Morning Ward 3 on April 18 with special guests Tom Evers, Executive Director of the Minneapolis Parks Foundation, and Chris Meyer, Minneapolis Park Board Commissioner, to discuss the community's vision for public parks along the riverfront. Wednesday, April 18 from 7:30 - 9:00 a.m.